The ambassadors of Spain, Jose Antonio Bordallo (L), of Britain, Peter Millet (2nd L), and of France, Antoine Sivan (3rd L), are welcomed by the Libyan Deputy Prime Minister of the Government of National Accord, Ahmad Meitig (R), in Tripoli on April 14, 2016. French, Spanish, and British ambassadors are in Tripoli in support of the new U.N.-mediated Libyan government. It is the ambassadors' first visit to the Libyan capital in two years, after most embassies closed in 2014 due to fighting between rival militias. Libya later became engulfed in war that split it between two rival governments and parliaments. The diplomats will meet with deputies of new Prime Minister Fayez Serraj. 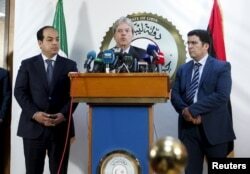 Italian Foreign Minister Paolo Gentiloni visited Tripoli last week and announced plans to reopen embassies. A member of the Presidential Council of Government of National Accord, Ahmed Maiteeq (L) and Italian Foreign Minister Paolo Gentiloni (C) hold a joint news conference in Tripoli, Libya, April 12, 2016. Italy, France, and other Western nations are increasingly concerned about a powerful Islamic State force in Libya that controls the city of Sirte and has perpetrated attacks across the country. These nations have offered to train security forces in Libya to fight this growing threat. Libya has been in a state of chaos since leader Moammar Gadhafi was toppled and killed in 2011.